Competition in the compact MPV sector is intense, but Citroen's C4 Grand Picasso has taken the fight to a new level. The fresh-looking seven-seat vehicle brings a welcome and impressive injection of style, flexibility and ingenuity to the market. Citroen's C4 Picasso range is easily one of the most stylish MPVs on the market, and one of the most unusual. The car's spacious cabin is bathed in light thanks to a huge panoramic windscreen and glass roof. The windscreen stretches above the driver's head, while the A-pillars have been slimmed down to increase visibility. 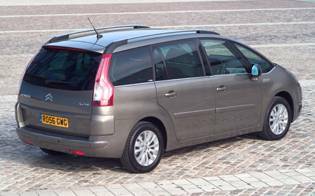 Front quarter windows mean that the traditional MPV blind spot problem has been reduced. Reminiscent of Citroens of old, the GrandC4 Picasso is full of oddities and quirky features. It has an electronic handbrake that releases automatically when you move away, a button-free central console and a fixed-hub steering wheel that houses all of the major buttons used to control the main display, audio, cruise control and hands-free telephone system. 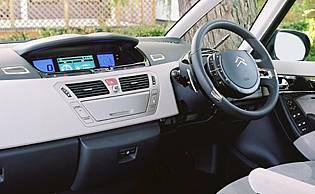 Citroen's choice of an electronic gearbox for selected variants is the main reason why there is so much space in the cabin. It consists of a steering column-mounted lever and a handbrake button on the dashboard. Not a true automatic but more of a clutchless manual, left in automatic mode the gearshifts can be a little jerky, although drivers can overcome this by changing gears with paddles located behind the steering wheel. The optional of a self-levelling rear suspension gives the Grand C4 Picasso a smooth and composed ride over a variety of road surfaces but it suffers from a hint of understeer when cornering - understandable for a car of its size with a suspension set for comfort. All in all, it delivers an enjoyable ride and an even more appealing prospect when you consider the quick and easy seat configurations available leaving plenty of room no matter what the arrangement. One of the best compact MPVs available and easily the most stylish, some will find the electronic transmission a little disappointing. The best advice is to use the paddle shifters for a smoother experience. 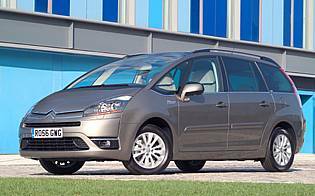 The car is good enough to tempt even customers with conservative tastes, and it's ideal for families who want a stylish seven-seat MPV packed with helpful and practical features.